Who is in your sweet family covey? This mother's birthstone necklace represents all those in your special family. The initial pendant is custom stamped with your family imitial. This necklace includes one birthstone and one initial. You can add on more birthstones to represent other family members for only $10 each. 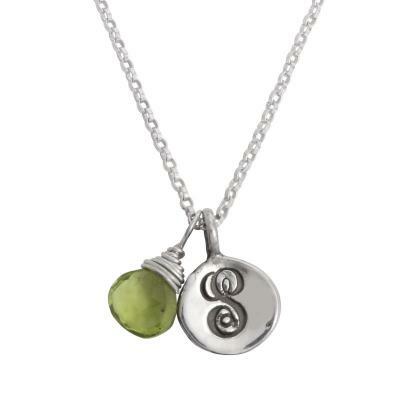 This birthstone mother's necklace comes with one stone and one initial. What a perfectly sweet present for the mother of one. Add on more birthstones to represent other family members for only $10 each. Every coveted member of your family can be represented on this lovely necklace. Garnet, amethyst, sapphire and rubies are just a few of the teardrops stones used to signify the birth months. A script initial charm is stamped with the last name initial and then surrounded by the stones of each child and parent. We think it is a simple yet stylish way to keep your family with you at all times. Please note: The price listed is the base price for a silver necklace with an initial and one stone. Each additional stone is $10. If you have two or more family members born in the same month, don't worry about switching up the order - it is a necklace to symbolize the loved ones in your life, it does not have to be in the exact order - use your imagination or just put the color combos you like best together! Get a stone for each child or grandchild and then add one for each parent. It is your personal covey of loved ones. All silver is sterling. Initial charm is approx 1/2". Stones vary in size but average 3/8" in height. Stones are as pictured but may vary in color slightly. Chain is available in 16" or 18". I had ordered the necklace and the bracelet for my daughter-in-law who gave me a beautiful grand daughter 6 months ago. She absolutely loved the gifts. Quality is great and the pieces are beautifully made. I gave this necklace to my daughter for her first Mother's Day. She absolutely loved it. It's so simple and sweet. I will probably start giving this as a gift to new mothers.